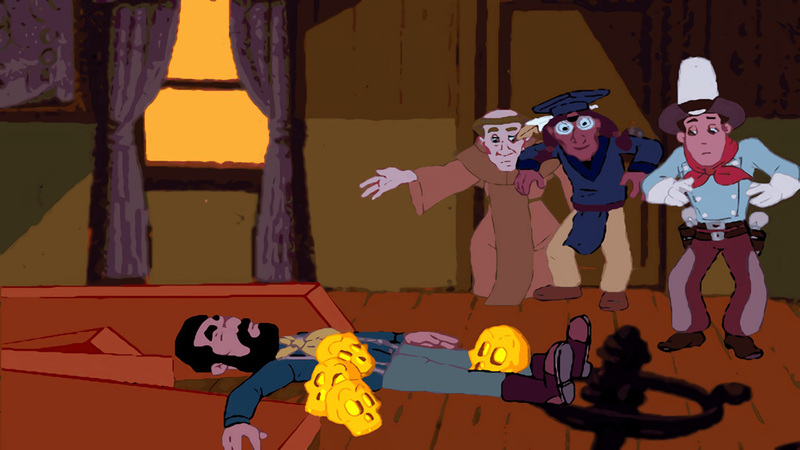 A peddler dead, killed by bandits trying to get a golden skull. A malicious monk seeking a treasure. A general ready to go to war with the Apache. A leaderless revolutionary army waiting for direction. And a slightly clueless gunman in the middle of it all. This might be why they call it the Wild West. Fenimore Fillmore: 3 Skulls of the Toltecs is a point and click adventure game from Casual Brothers. Originally released in 1996, this is a remastered version which brings the story of the three skulls to modern PCs with 4k graphics. 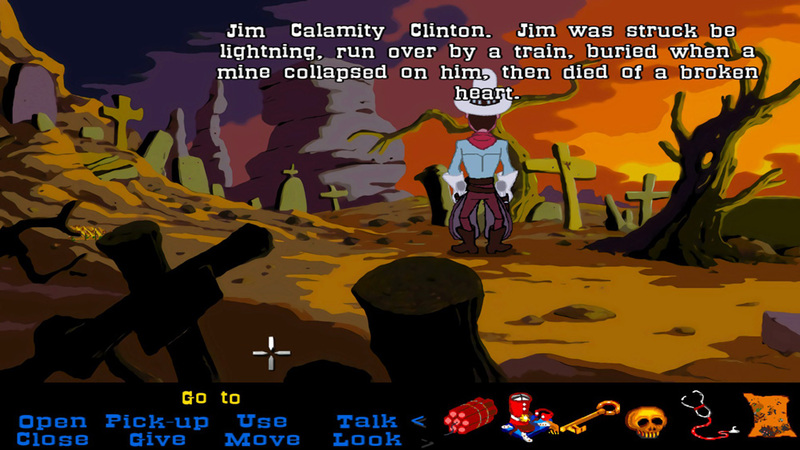 Players lead gunfighter Fenimore Fillmore through a series of puzzles, collecting items, talking to characters, all while discovering Big Town and its surroundings. 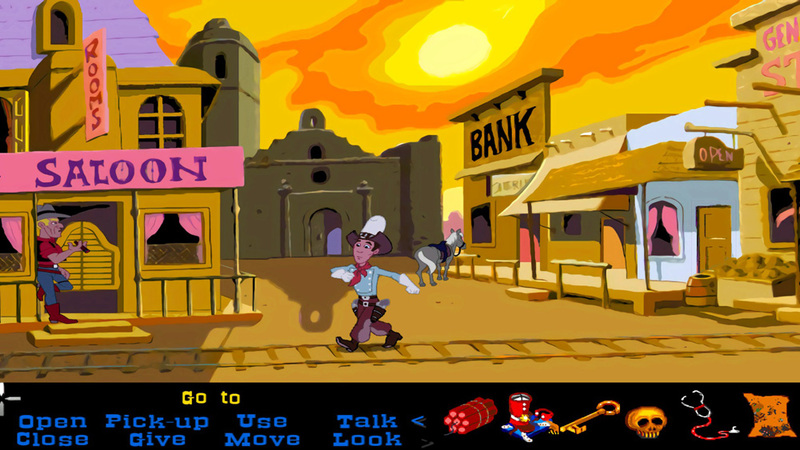 This is classic point and click; locations and characters occupy the majority of the screen, with action buttons and an inventory running along the bottom. 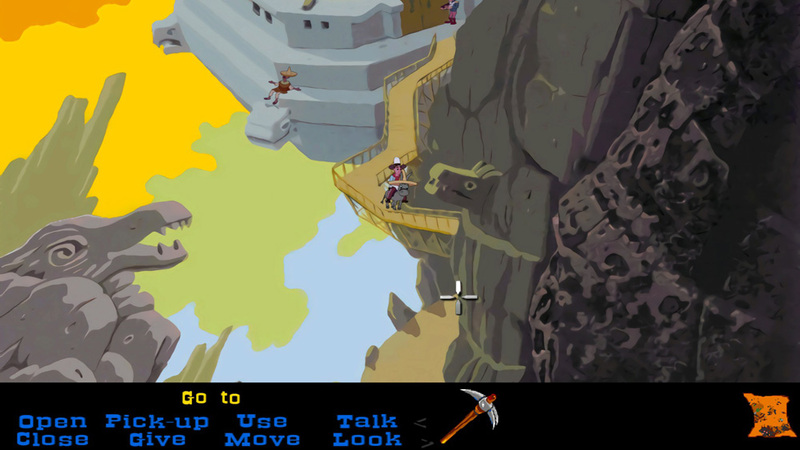 Players choose actions and select portions of the environment to interact. Items can be combined, characters talked too, and locations explored. It is up to the player to figure out what the puzzles are, and how to solve them. Anyone familiar with the original Fenimore Fillmore: 3 Skulls of the Toltecs isn’t going to be too surprised. None of the locations, characters or puzzles have changed. So too, it sounds like all the original voice work, sound effects and music has been retained. What is on offer here is a graphical upgrade. While from the late 90s, a time when adventure games were starting to adopt a far cleaner and stylised look on the whole, the original game featured cartoonish though pixilated visuals. This remastered version attempts to deliver a crisp and clear experience for the modern player. And it succeeds, to a degree. There is an obvious charm to the classic character designs. They echo early 20th Century animations, with balloon-like proportions, simplistic shapes and copious amounts of visual shorthand. So too the backgrounds have a pleasantness about them, being drenched in stylistic abstraction and bold colours. The images for the inventory items are fantastically realised, and indicate the participation of an excellent artist. The issue is how these visuals have been reinterpreted and implemented for this remastering. In game character animations can vary wildly in quality, even with just Fenimore himself. The basic set of him walking and talking has been remastered well, but there are incidental animations in which the look of the character changes from second to second. So too there are characters scattered throughout the game with heavily pixilated portions, sections cut off, or even one whose arm flickers to being a white box. The backgrounds can also be hit or miss. Some are recreated to perfection, like the long shot of the Monastery or the inside of the Church. While others are scratchy, blobby or indistinct. Big Town is a major set piece of the game, but there are portions of it that just feel so off. Then there are the cinematics; whatever treatment was done to the original cinematics has not yielded a particularly consistent or attractive result. Figure lines are wobbly, with some stopping and starting or just petering out to almost nothingness to bulk out again. Important details like faces, on many occasions, are indistinct or nonsensical. And then there are the occasions where animations play far, far too quickly to be able to tell what is happening. Of course, this is all just to do with the remastering. There is a game in there too. So what is that like? It’s a faithful recreation of the original. In that it brings all the baggage titles from this period have. The puzzles are a mix of being well-implemented and nonsense moon logic. There is a lot of going back and forth between locations, leaving areas and returning immediately to see a character who by all rights should have just walked out of a door when you were there before. These are usual strange conceits of the genre. The most glaring issue, though, is some of the content. Again, a product of its time, there are some extremely questionable stereotypes. Both during voice acting performances, and in how certain cultures are presented. As well as some, quite honestly, off-putting sexual innuendo. I suppose the main thing that perplexes me is, I don’t know who this remaster is aimed at or what it is for. It’s great that fans can reconnect with the game, especially if they haven’t had access to it, but want to relive the memories. So too, the newer generation of gamers getting a chance to experience a title from the past is an important part of understanding game history. But there are no original graphics options, which would be catering to the old fans. And no commentary or context for new gamers. An old game, with a slightly archaic puzzle logic and possibly offensive content, is just offered up with a slap of new paint and no explanation as to why this exists. It seems to be with the best of intention, but quite poorly executed. Which is a great shame, as Fenimore Fillmore: 3 Skulls of the Toltecs itself is an above average game. Saddled with the indiscretions of its past, it still manages to deliver some quite interesting challenges and a handful of genuine laughs. But ultimately I don’t think just updating the graphics is enough for a title like this. It needs to take the players back to 1996 and help them to understand why certain content decisions were made. Fenimore Fillmore: 3 Skulls of the Toltecs will be a nostalgic revisiting for fans of the original. But they are likely to be let down by inconsistent upgrades and the addition of a slew of little mistakes. Players new to the game are more than likely going to be perplexed, if not outright aghast, at the nature of some of the content. Grab the game only if you are really aching for a truly retro point and click adventure, or want to relive your past. Fenimore Fillmore: 3 Skulls of the Toltecs is developed and published by Casual Brothers. It is available now on Steam.